Tobacco companies aggressively block, weaken, and undermine policies designed to protect public health and reduce tobacco use, and at times they may work outside of Indonesia’s laws. #PhilipMorrisInternational is being accused of illegal sponsorship and advertising in Indonesia. I support an immediate government investigation into these allegations! In Indonesia, Philip Morris International allegedly circumvented Indonesia’s ban on media promotion of tobacco advertising, promotion and sponsorship of tobacco by utilising social media promotions. 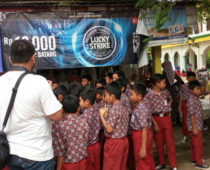 The Conversation: "Tobacco company in Indonesia skirts regulation, uses music concerts and social media for marketing"